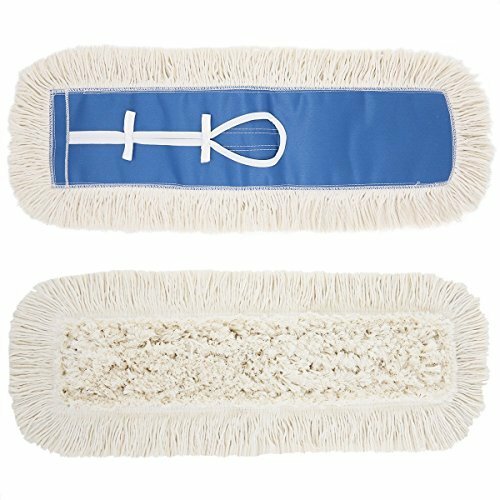 LARGE 35'' X 5'' WIDE COTTON MOP HEAD - Super absorbent cotton yarn perfect for damp mopping and dry sweeping. 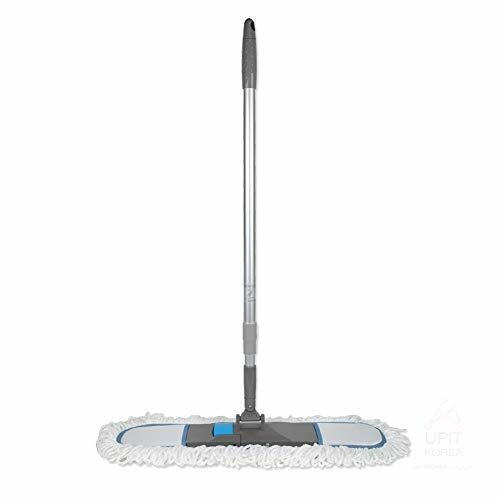 When fully spread out the mop head measures 41'' X 12'' making it a large enough mop to clean efficiently and effectively. 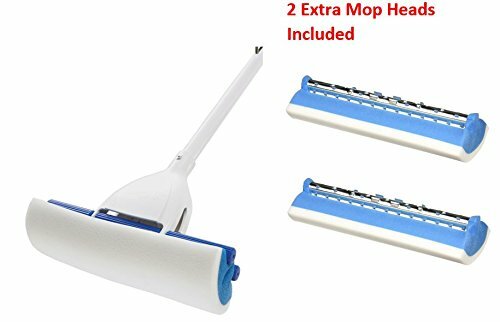 MULTI SURFACE USE - Use this mop to clean all types of surface areas including wooden floors, kitchen floors, restaurant floors, bathroom floors, garages, warehouses, office floors, tile floors, marble floors, and hardwood. STURDY AND RELIABLE 63'' WOODEN HANDLE WITH METAL FRAME INCLUDED - We also chose a traditional wooden handle with a steel metal frame so you can have a sturdy and reliable handle that can withstand all types of cleaning and maneuvering without having to worry about it snapping like plastic. The steel metal clip also includes a plastic slide to allow you to lock or unlock the swivel action. MULTI USE Do you have dirt marks on your walls? Does dust cling to your baseboards, trim and ceiling fans? The Chomp 5 Minute CleanWalls dust mop makes tackling these tough cleaning tasks a breeze. VERY LIGHTWEIGHT DESIGN. 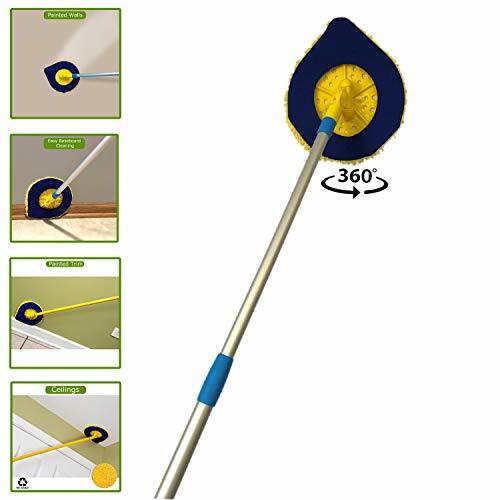 The circular mop head glides smoothly over flat surfaces to quickly clean large areas, while the 360-degree hinge and pointed tip allow you to rotate it in any direction and easily clean tight spaces or corners. The soft microfiber cleaning pad is safe for all surfaces and won t scratch paint. CLEANER, HEALTHIER HOME We regularly clean our floors and countertops but often forget about the 4 walls around us and what s above. Chomp dust mops can be used for dry dusting, damp wiping or wet washing for a complete clean that removes dust, dirt, grease, grime, allergens, and odors to help improve your indoor air quality. 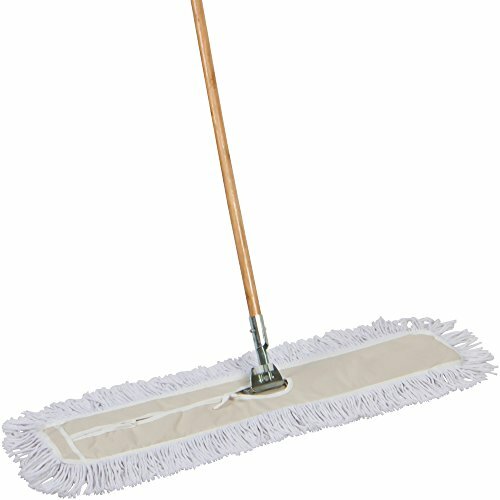 LONG REACH This specialized wet/dry mop is made with a telescoping handle that extends from 26-47 inches so you can easily clean up high or down low. No more balancing on a shaky ladder or cleaning on your hands and knees and hurting your back! The handle s lightweight, ergonomic design also makes it user friendly so your arms and hands don t get as tired. WASHABLE AND REUSABLE Cleaning with the Chomp dust mop is easy and good for the environment. Unlike disposable cleaning wipes, our reusable microfiber cleaning mitt can be tossed in the wash for hundreds of uses, and the plastic parts are all BPA free. This means more savings for you and help for Mother Earth. CLEANWALLS SYSTEM TOOL 2 YEAR GUARANTEE. Complete the Chomp 5 Minute CleanWalls system when you pair our wall and ceiling mop with our powerful cleaner and deodorizer spray (sold separately). No other cleaning tool combination can clean and deodorize an entire room in minutes! These products are ideal for routine cleaning or painting prep - you d be amazed at how drastically dust and grease buildup can impact paint coverage. Get your Chomp mop today! Warranty: 2 year guarantee. If your cleanwalls tool breaks, we will fix or replace it, guaranteed. LARGE 35'' X 5'' WIDE COTTON MOP HEAD - Super absorbent cotton yarn perfect for damp mopping and dry sweeping. 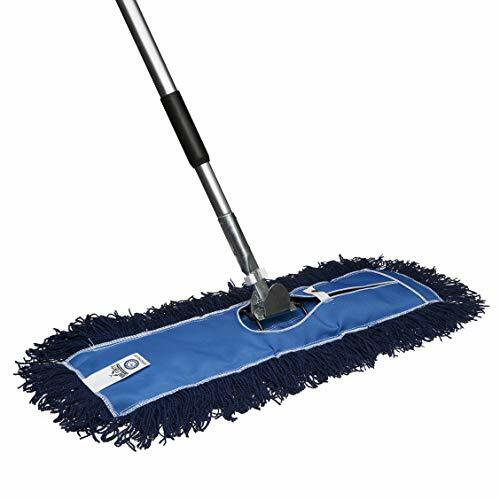 When fully spread out the mop head measures 41'' X 11'' making it a large enough mop to clean efficiently and effectively. 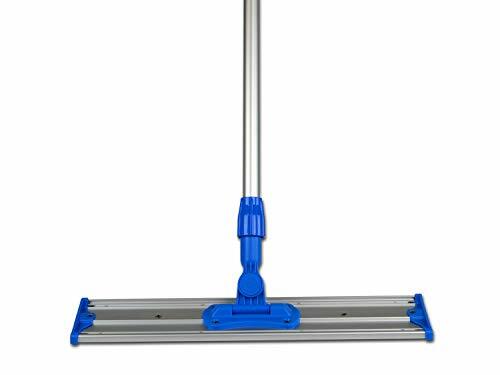 MULTI SURFACE USE - Use this mop to clean all types of surface areas including wooden floors, kitchen floors, restaurant floors, bathroom floors, garages, warehouses, office floors, tile floors, marble floors, and hardwood. STURDY AND RELIABLE 60'' METAL TELESCOPIC HANDLE HANDLE WITH METAL FRAME INCLUDED - We also chose a metal telescopic handle that extends from 39'' to 60'' with a steel metal frame so you can have a sturdy and reliable handle that can withstand all types of cleaning and maneuvering without having to worry about it snapping like plastic. The steel metal clip also includes a plastic slide to allow you to lock or unlock the swivel action. LARGE 35'' X 5'' WIDE COTTON MOP HEAD - Super absorbent cotton yarn perfect for damp mopping and dry sweeping. 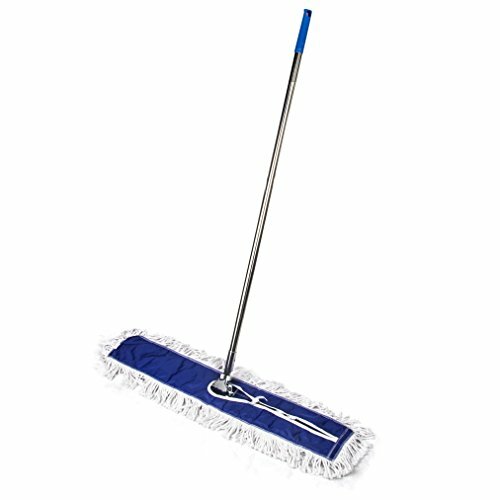 When fully spread out the mop head measures 41'' X 11'' making it a large enough mop to clean efficiently and effectively. STURDY AND RELIABLE 60'' METAL TELESCOPIC HANDLE HANDLE WITH METAL FRAME INCLUDED - We also chose a metal telescopic handle that extends from 39'' to 60'' with a steel metal frame so you can have a sturdy and reliable handle that can withstand all types of cleaning and maneuvering without having to worry about it snapping like plastic. The steel metal clip also includes a plastic slide to allow you to lock or unlock the swivel action. 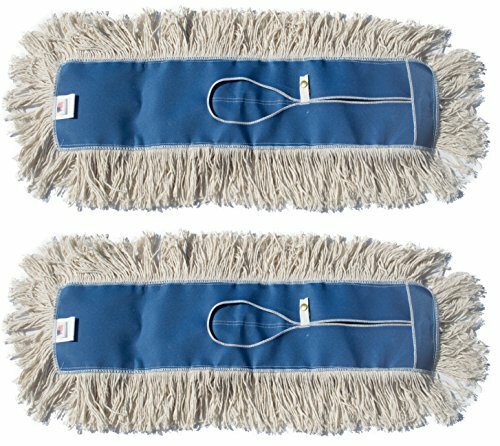 This Dust Mop Head Replacement is Hand Made in the USA From High Quality Cotton Yarn. This Dust Mop was Designed for Industrial use Making it Durable and Extending the Service Life. 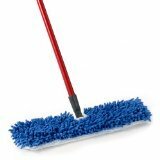 2 | 24 Inch Floor Mop Head refill is hand sewn in the USA from High Quality Natural Cotton Yarn. LOVE YOUR PETS BUT HATE THE MESS ? 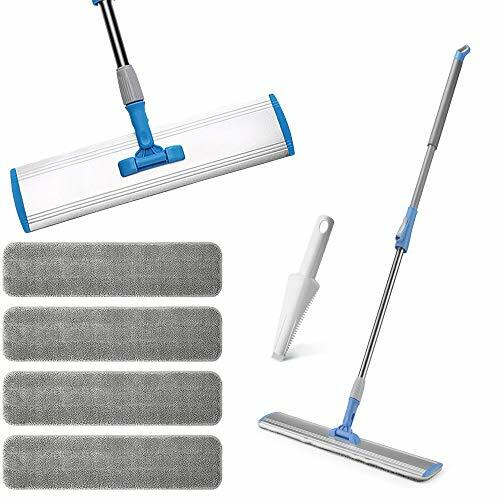 Remove dog and cat hair with one swipe or take care of that occasional pet accident with ease.TheSturdy Microfiber Mop Kit_ Pole and Mop Frame is made out of strong durable Aluminum ,Bonus - 4*Free hardwood floor Microfiber Mop,Wet Dry Use Refill ($11 value),machine washable up to 100 times . 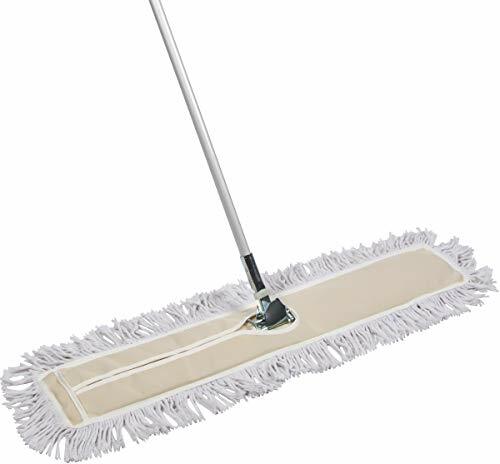 Scotch-Brite Floor Mop, Microfibers, Hardwood Floors Mop head lifts and traps dust and dirt. Use dry or wet with floor cleaning liquids. Great on all hard surfaces, including hardwood, laminate, vinyl and tile flooring. Machine-washable mop head. 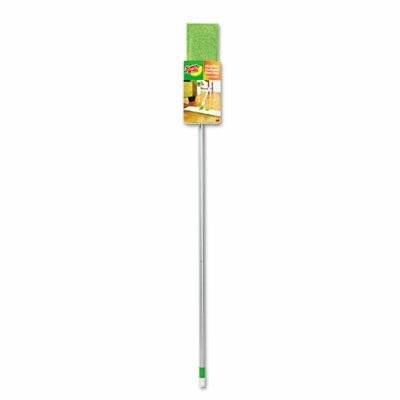 Application: Floors; Mop Head Size: 17" Wide; Handle Length: 60"; Mop Head Color: Green. Great on all hard surfaces, including hardwood, laminate, vinyl and tile flooring. Cleaning Supplies; Mop; Swabs; Cleaning; Janitorial; Maintenance; Products; Equipment; Sanitation; Jan/San Microfiber floor mop. 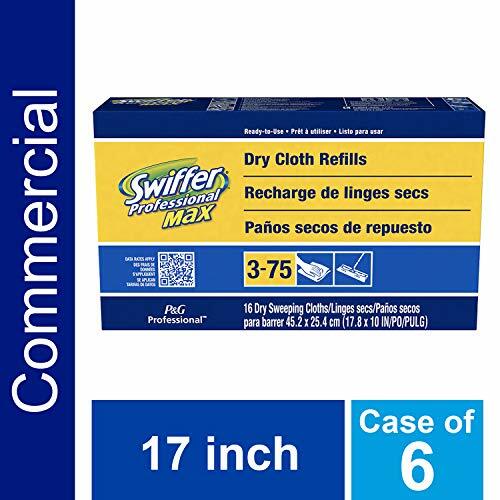 Brand: Scotch-Brite | Manufacturer: 3M/COMMERCIAL TAPE DIV. The last dust mop you will ever buy! Very sturdy commercial/institutional quality mop kit for professional or home use. Pads are washable and reusable, just don't use fabric softener with them. Wet pads can be used with a floor spray or can be submerged for wet mopping action. Heavy duty. Designed for home, industrial and commercial mopping. Machine washable. 24 x 5.5, fit all standard 24 mop frames. 3 long threads, save time and effort with extra large floor coverage. 100% cotton provides added durability for dry or wet mopping larger areas. Quick-dry blue top with reinforced binding around keyhole opening for added protection against raveling or fraying. The innovative cleaning power of Magic Eraser Mops works wonders on your floors. Deep penetrating action gets out dirt and grime trapped in grooves and surfaces, so floors really shine. Wringing lever keeps your hands dry. Safe for no-wax floors.